(CNN) Nobel laureate Aung San Suu Kyi has made her first public comments on the fate of her country’s persecuted Rohingya minority since new violence broke out almost two weeks ago. According to a readout of the call, she added her government was fighting to ensure “terrorism” didn’t spread over the whole of Rakhine state. Suu Kyi has come under fire in recent days for failing to speak out against the mass killings and displacement of Rohingya by her government, particularly given her previous image as a champion of human rights. During the call, Suu Kyi said her government was already working to protect the rights of the Rohingya. 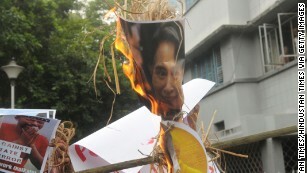 “We know very well, more than most, what it means to be deprived of human rights and democratic protection,” Suu Kyi said, according to a readout of the call. Refugees brought with them stories of death and destruction from inside the western Myanmar province. Satellite imagery released by Human Rights Watch allegedly shows entire villages razed to the ground. 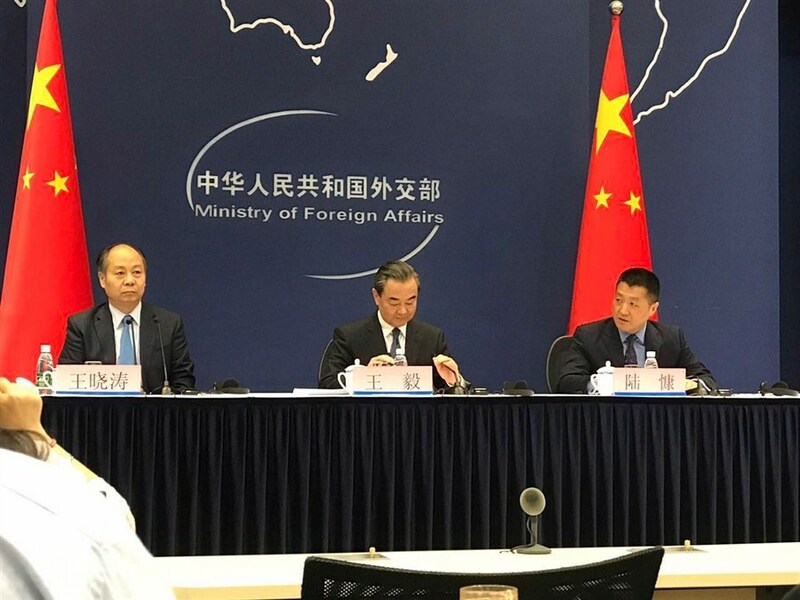 Following Erdogan’s call with Suu Kyi, a spokesman for the Turkish presidency announced the Turkish Cooperation and Coordination Agency (TIKA) would be allowed to deliver 1,000 tons of aid to Rakhine State. 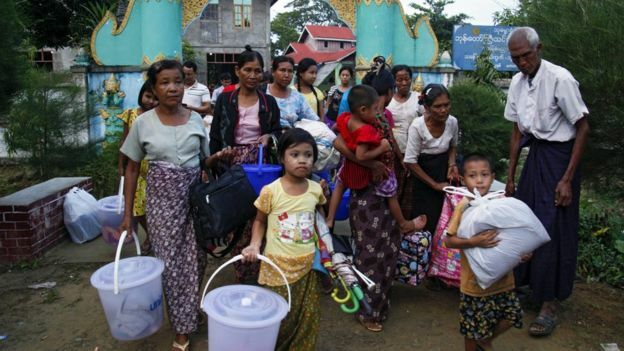 “The aid will be delivered to the Maungtaw and Buthi Taung areas in the northern regions of Rakhine … to the hundreds of families displaced from their homes and villages as a result of attacks,” spokesman Ibrahim Kalin said. The spokesman added as the region was still unsafe, aid would be delivered via military helicopters in cooperation with Rakhine authorities. Myanmar’s Rohingya ethnic minority members walk through rice fields after crossing over to the Bangladesh side of the border, Friday, Sept. 1. Turkey isn’t the only one sending aid to the troubled province either — the Migrant Offshore Aid Station Foundation (MOAS) announced Monday it would relocate to Myanmar to help fleeing refugees. Who are the Rohingya and why are they fleeing? MOAS is the organization that has been working since April 2014 to rescue migrants attempting to cross the Mediterranean to Europe on often unsafe vessels. They claim to have already helped more than 40,000 people, including children. “Building on MOAS’ long-standing dedication to alleviating the plight of the persecuted Rohingya minority, MOAS is therefore undertaking a strategic shift of its operations to South East Asia,” the organization announced on their website. Myanmar has faced a growing chorus of outrage from across the Muslim world following the most recent outbreak of violence inside Rakhine State. 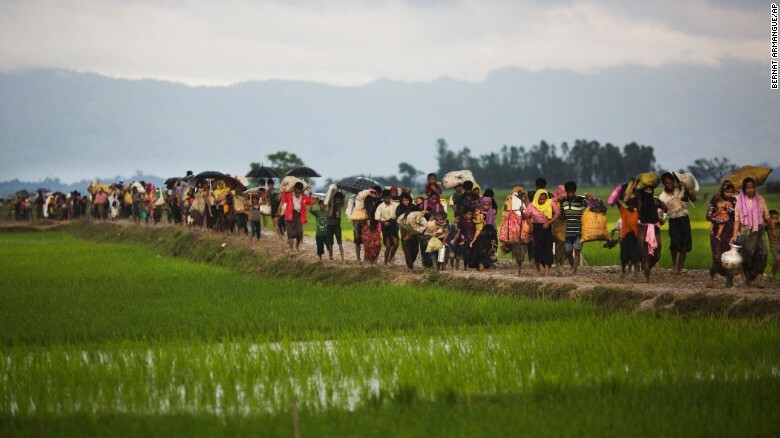 Leaders of several Muslim majority countries, including Turkey, Indonesia and Pakistan, have issued strong statements calling out the ongoing persecution of the Rohingya. Indonesian Foreign Minister Retno Marsudi flew to Myanmar on Monday for talks for state councilor Suu Kyi, after her president Joko Widodo said real action was needed to stop the conflict. Indian Prime Minister Narendra Modi is due to hold talks with Suu Kyi during a state visit to Myanmar on Wednesday. 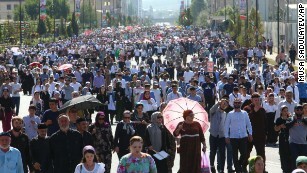 Multiple countries have also seen large protests in support of the Rohingya people, including a mass march in the Chechnyan capital of Grozny and outside the Myanmar embassy in Jakarta. 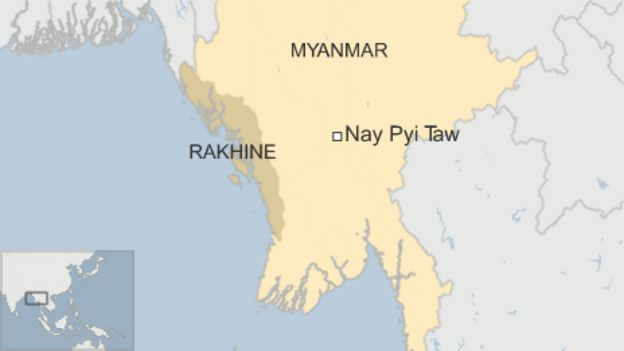 The Myanmar army says it shot dead at least 25 people in Rohingya Muslim villages in restive Rakhine state on Sunday. It said the people killed had been armed with machetes and wooden clubs. On Saturday, the army launched attacks with helicopter gunships on Rohingya villages in Rakhine. Eight people, including two soldiers, died. The attacks were “clearance operations” targeting armed militants, the army said. Images and videos on social media showed women and children were among those killed. There’s no independent media access to northern Rakhine State, so the official accounts must be read critically. If you’re to believe the army version you have to accept that Rohingya men armed only with “wooden clubs and machetes” would launch attacks on soldiers equipped with guns. You also have to accept the idea that the Rohingya are setting fire to their own homes, making themselves intentionally homeless. State media report that the Rohingya torched 130 homes on Sunday in order to “cause misunderstanding and tension” and get international aid. There’s a very different narrative on Rohingya social media. Again it should be viewed critically, in the past the Rohingya have exaggerated alleged atrocities. The Rohingya images and videos from this last weekend show dead women and children and people fleeing burning homes. Helicopter gunships fly overhead. Some of it is certainly genuine. The security forces in Rakhine are controlled by the army not the country’s de-facto leader Aung San Suu Kyi. But the former Nobel peace prize winner is conspicuously silent. So far she’s refused diplomats’ demands for a credible independent investigation into events. 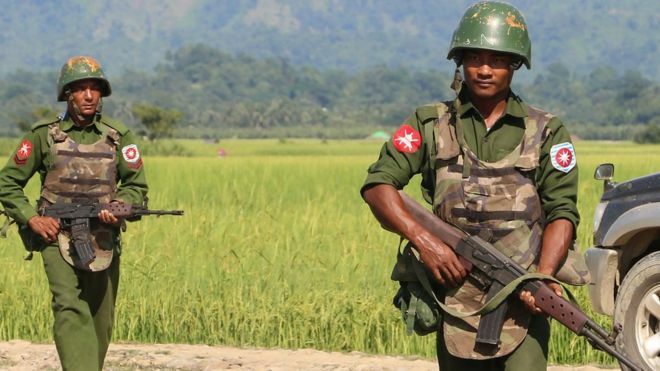 Rakhine has been under military lockdown since last month, after nine policemen were killed by insurgents in a series of attacks on border posts. The state is home to more than a million Rohingya Muslims, who are not recognised as Myanmar citizens. Tens of thousands are living in temporary camps, after being displaced during fighting with majority Buddhists in 2012 which left scores dead. The Rohingya are disliked by many in Myanmar, who consider them illegal immigrants from Bangladesh, despite many having lived in the country for generations. Rights groups say the Rohingya population has been subject to severe restrictions on movement and are denied the most basic of human rights.